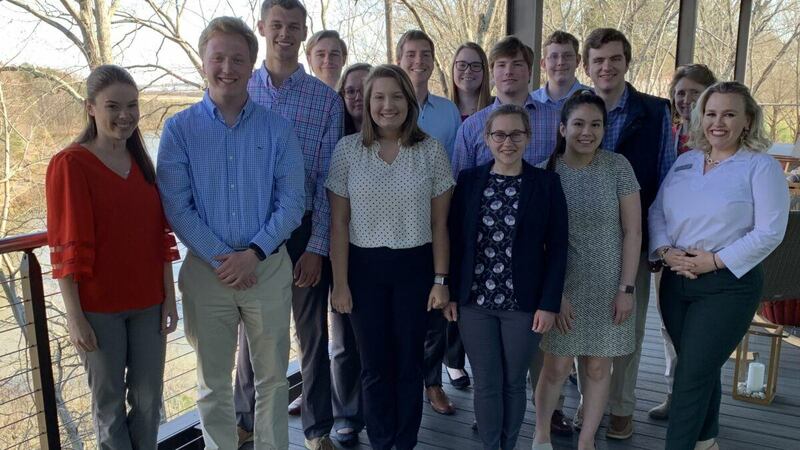 BUIES CREEK, NC – Second-year students from Campbell University’s BB&T Business Fellows Program spent two days in Greensboro last week, visiting businesses and participating in a day-long workshop at the BB&T Leadership Institute. The trip was designed to help the students develop leadership skills and learn from successful entrepreneurs in the restaurant and real estate development fields. The Business Fellows also received a guided tour and talk at the International Civil Rights Center and Museum in downtown Greensboro. As the students connected with local business owners, they ate dinner at Crafted: The Art of the Taco and heard about co-owner Kris Fuller’s experience starting new restaurants that helped revive downtown Greensboro. They also visited The Forge, a “makerspace” designed for crafts, tech, trades, and manufacturing; and HQ Greensboro, the region’s leading entrepreneurship co-working space, where business owner and developer Andy Zimmerman discussed opportunities he found in redeveloping a once-declining part of town into a vibrant destination. Campbell University’s BB&T Business Fellows Program is a selective, four-year cohort program designed to provide unique academic, service, and professional developmental opportunities to exceptional incoming freshmen. The goal of the Business Fellows Program is to provide students a unique opportunity to build skills in leadership, critical thinking, and problem-solving to prepare students them for a successful business career.